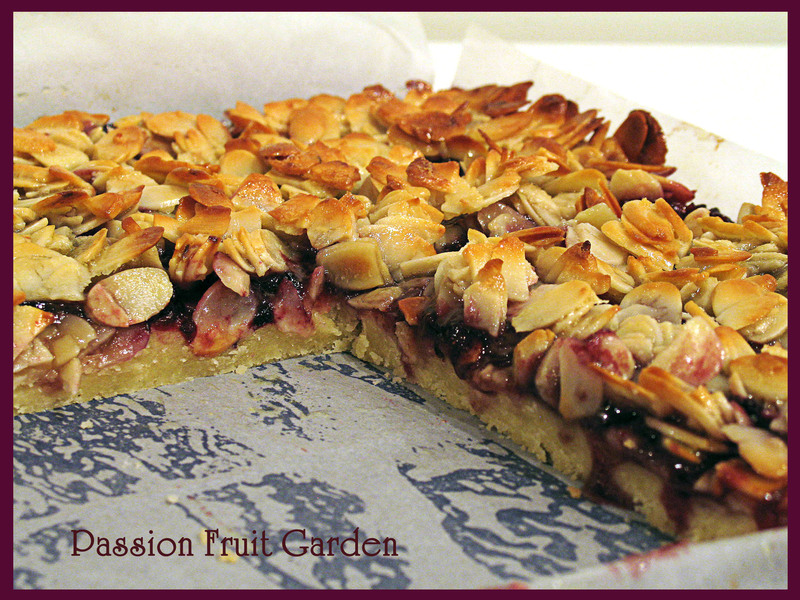 I was reading Heidi’s IMK post this month and noticed her beautiful blueberry and almond slice. It really took my fancy. I have blackberries in my freezer and I remember thinking how good it looked and wondering whether I could adapt it for blackberries. I bought flaked almonds to make it but then forgot about my resolve. I have blackberries in my freezer because my very generous neighbour, Renate, grows blackberries and gave me two tubs last summer. I have been meaning to use them for ages. The other day I went onto Eat Your Books to see what recipes I had for a nice winter sweet with blackberries and spied this recipe. As I already had the flaked almonds, I decided to give it a try. The recipe is from Delicious Magazine August 2010. It is by Bill Granger. He also has Almond and Raspberry Slice which is the same recipe but with raspberries; clearly, the fruit is interchangeable. If you decide to substitute the fruit (I am sure apricots would also be good), use jam of the same flavour. The slice is very rich and extraordinarily yummy. It is probably too rich for a quick coffee and bickie (though Maus and I seem to be coping) but it would be perfect as a dessert with a dollop of cream or scoop of ice cream, or for a special morning or afternoon tea. Lightly grease a 20cm x 24cm slice pan (I used a 23cm x 23cm pan and it was fine) and line the base and sides with baking paper. Combine the almonds, milk, 60g butter, 55g sugar, and 1 tsp vanilla extract in a saucepan. Cook over a very low heat until the butter has melted and the sugar has dissolved. Remove from the heat and set aside to cool. Beat the remaining butter, sugar and vanilla extract in an electric mixer until pale and creamy. Sift the flour and cornflour together and add them to the butter mixture. Beat on low-speed until just combined. Press the dough into the prepared pan and bake for 10-12 minutes or until lightly golden. Remove the pastry from the oven and leave to cool for 10 minutes. Place the jam and blackberries in a small bowl and lightly crush with a fork. Spread the jam mixture over the base then spread the cooled almond topping over the jam. Bake for an additional 25 minutes or until golden. Cool slice completely in pan then remove and cut into squares. 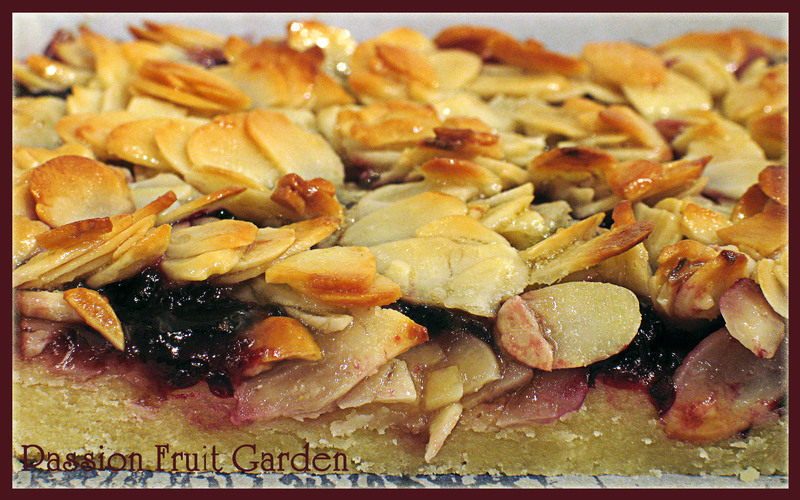 This entry was posted in Biscuits & Slices, Sweet Things and tagged Almond and raspberry slice, Bill Granger by Glenda. Bookmark the permalink. Is there such a thing as ‘too rich’?!! Looks fab Glenda! Last piece just disappeared into Maus’ mouth. Obviously it wasn’t too rich. This is some slice! Love the almond topping. They’re roasted perfectly and I can almost hear the crunch as that first piece is cut. Very nice, Glenda. Hi John, we have eaten a wee bit more than is good for our waistline. Hi aunty Glen, I have been following your blog and made a few of your recipes lately. I made the saltimbicca (delic!) and yes I could not source veal in Scotland! Also Belle helped me make the choc and zucchini loaf for a teddy bears picnic. Was a big hit with the kids and Tom Bear. I showed my friend jac your photos of Lebanon. Also really enjoying reading about your travels to Portugal, Rob and I loved our trip there. I love the look of your choc tarts but no time for me to learn to temper chocolate!! Hi Kate. The choc and zucchini loaf is great isn’t it? Thanks for reading and bothering to comment. luv ya.